Are Your Helpdesk Emails Too Nice? An overdose of sweetness in any helpdesk email can do more harm than good. The reason for this is that customer might think that the helpdesk reps are not addressing the problem adequately. And it might also seem fake. The right way to do this is to be polite and at the same time, not go over-the-top with sweetness to placate the customer. Try and keep it real. Let’s look at it this way – a customer is coming to you with a problem and wants you to be as straightforward with the solution as possible. 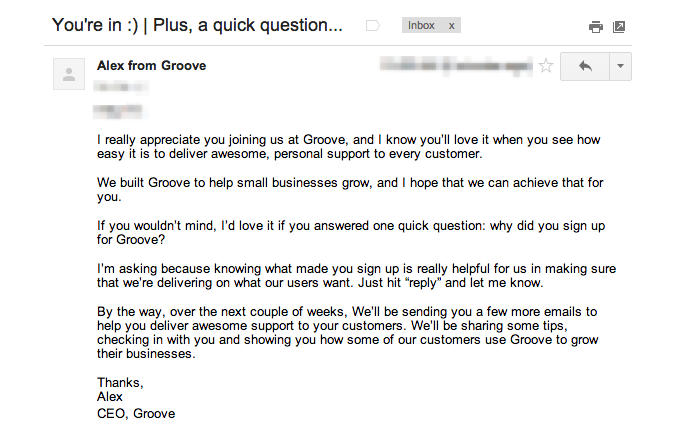 A customer joined Groove (the helpdesk software) and received this email from the Groove Helpdesk team. Notice how the team was indirect with its messaging and kept running in circles to address just one point i.e., providing product feedback. Plus you will notice this is a canned reply, which sometimes doesn’t serve the purpose right. Be straightforward with your replies. However, this doesn’t mean you need to be rude. Just don’t be too submissive to whatever the customer is saying. Call a spade a spade, irrespective of who is at fault, you or the customer. If the negligence is from your end – apologize, fix the issue speedily and move on. Be friendly and acknowledging, but don’t over do with the sweet talk. You can reassure the customer, address the issue and solve it in real-time. Never be over generous with compensation because many complexities are involved in using a software, which means glitches are bound to happen. Customer service should not always look at compensation as a solution. Rather customers across the globe (many of whom now own software companies themselves) understand the complexities and respect timely response on those glitches. For instance, at Agile, many of our customers are better satisfied when we respond quickly and fix issues promptly, rather than compensating them with free upgrades/emails. Never start the email by pointing out the customer mistake (even if it’s their mistake). Be polite but at the same time be assertive. Explain to them about the issue, let them understand the mistake and demonstrate the proper procedure to rectify it. Handling customers can sometimes be similar to handling kids – being rude won’t work but being too sweet won’t cut it either. Bulky Helpdesk emails can be annoying especially when not required. It is best to keep them short and to the point. It is important to keep your reply relevant to the question and make it crisp. Cut out unnecessary verbiage and jump to the solution for the issue at hand. And don’t forget to keep it simple. I’m visiting Sydney and I have tried over three days and three different internet connections to upload photos to Buffer via the web or mobile phone app. Nothing works/always gives me an error message after uploading the file. It is making Buffer useless to me in a hurry. Please help! I want to love you guys but this is kinda a deal-breaker. Remember this – keep it REAL. Try to understand that your customer is in a predicament and requires you to solve it speedily. Maintain the friendly tone, at the same time, keep it direct and short. Acknowledge the fact that too much flattery or over-the-top sweetness can sound fake, and will hurt the relationship you are trying to build with the customer. Your customer is having trouble using your product or service, grasp that reality and take it from there. Get your customer’s point of view about the issue, then shed some light on why this issue is occurring and assure them that it will be solved. This is how you make a customer happy and satisfied.